Baku, an organizer and venue of many major international sport events, will once again bring together the sporting community in 2018. This time, the representatives of the FIG affiliated federations and FIG Council members will gather in Baku for the Congress - the FIG’s supreme authority. Azerbaijan’s capital city will open its doors for the 82nd congress of the International Gymnastics Federation (FIG) on December 2-3, 2018, where the participants will discuss the important issues in gymnastics. 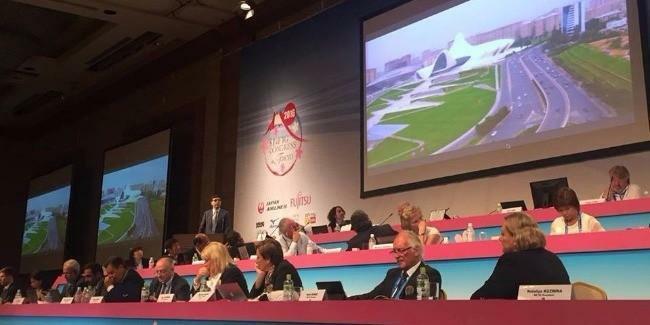 The decision on Baku’s hosting the next FIG congress was made at the 81st congress held in Tokyo. Elections to the Appeal Tribunal of the FIG took place on the second day of the 81st Congress. Mehman Aliyev, International Relations Manager of Azerbaijan Gymnastics Federation (AGF), was elected as a member of the tribunal concerned, having received 64 votes. Previously, Aliyev was a member of the FIG Disciplinary Commission. Also, in 2017, Azerbaijan’s capital will host a meeting of the Board of FIG. Gymnastics has already gained a momentum in Azerbaijan and not conceding to other sports, which have already taken deep root in the country. The country has become home for many significant gymnastics international tournaments over the recent years. Today, all seven gymnastics disciplines acknowledged by the FIG are being developed in the country. Designed to host all gymnastics disciplines, National Gymnastics Arena opened in 2014, is now able to host gymnasts' training for international tournaments.